"You have brought many people into this world who can change it," reads one of the congratulatory notes to Professor Robert G Edwards, the British biologist who today won the 2010 Nobel Prize In Physiology or Medicine for his seminal work on in vitro fertilization (IVF). IVF is used to treat infertility, a medical condition which affects more than 10 percent of couples worldwide. Professor Edwards began his IVF studies back in the 1950s. He discovered important principles for fertilization and accomplished his first IVF successes at that time in petri dishes. Although other scientists had achieved success with IVF for rabbits and other small animals, Edwards was the first to discover that different hormones regulate the maturation of human eggs and that IVF might be effective in human females whose eggs were removed after they were already mature. Edwards contacted gynecologist Patrick Steptoe, a pioneer in laparoscopy, and together, they were able to advance IVF from a laboratory technology to a clinical procedure. 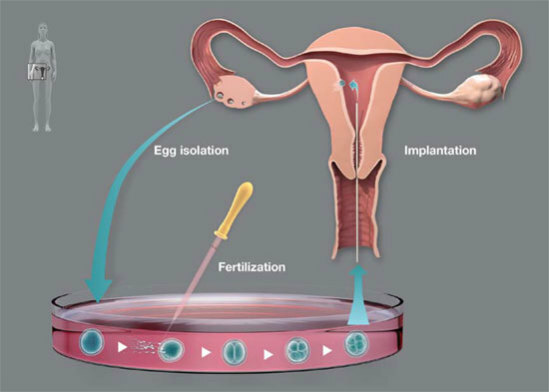 Steptoe would use the laparoscope to remove the eggs from the ovaries and Edwards would fertilize the eggs in cell cultures to develop embryos. Through a private donation, Edwards and Steptoe managed to have enough resources to continue to perfect their work. It took, however, until 1978 for the first 'test tube' baby to be born via IVF, Louise Brown. The center for IVF therapy that Edwards and Steptoe developed, the Bourne Hall Clinic in Cambridge, became a training center for cell biologists and gynecologists from all over the world. Since 1978, the IVF process has been refined and improved. It is considered a safe and effective treatment and now about 20 to 30 percent of fertilized eggs lead to the birth of a child. Long-term studies show that IVF children are as healthy as other children. Since 1978, more than four million people have been born following IVF; many of them have already had their own children!